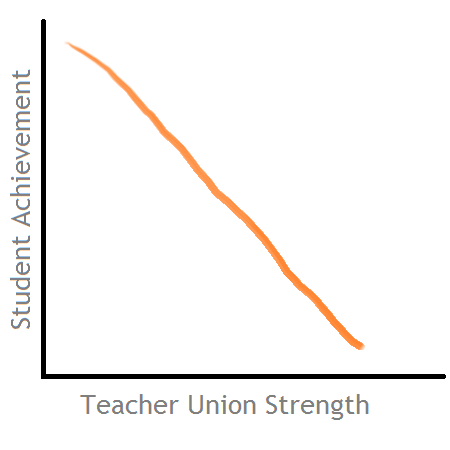 A new paper in the Economics of Education Review details the inverse relationship between student performance and teacher union strength. As I’ve written before, especially in Chicago, the teacher’s union is a body that persists legacy thinking such as tenure based pay and ignoring empirical methods of measuring and incenting performance. I’m not sure why anyone would expect results to be different than what was found. The CAPS meeting last night uncovered an issue of measurement that leads to unproductive conversation about crime trends. The beats and districts haven’t been consistent over the past few years, so measuring changes based on those categories is tricky. To remedy this, we should use actual geographic locations to normalize the data. Basically, Diversey to Sheridan & Sheridan to Racine. While the “People Taking Things” index seems flat, the high number of thefts is obscuring the rise in the more serious offenses. Robbery, motor vehicle theft, and burglary are all up. Excluding theft, this index is up 21% from 2008. The overall “Harm” index is up 22%, with criminal trespass the most notable increase. The “Decorum” index is up 39%, driven largely by the 70% rise in Narcotics reports. As we see the 2013 numbers come in, our success should not use 2012 as a baseline. We should use 2008 as a benchmark and normalize for geographic area. If we do this, we can begin to have productive conversation about fixing the issue. An under-the-radar shift is occuring on Chicago’s North Side. Parts of the Lakeview neighborhood, most notable to visitors as home to Wrigley Field, have recently transformed from one of the cities safes areas to one of the more dangerous. In the past 90 days, beat 1924, which includes the Wrigley Field area, was#1 in all of Chicago for robbery incidents. Here’s a post from a blog covering the issue in depth. 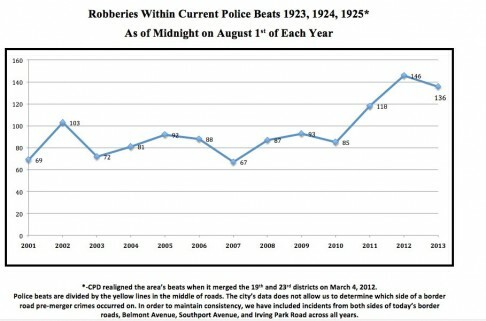 Below is a chart from the blog, showing the marked increase in crime in 2011, and the persistance of that rate through this year. This rise largely coincides with decreased officer presence due to a precent merger and civic priorities (shifted focues to South & West Sides and Michigan Avenue). 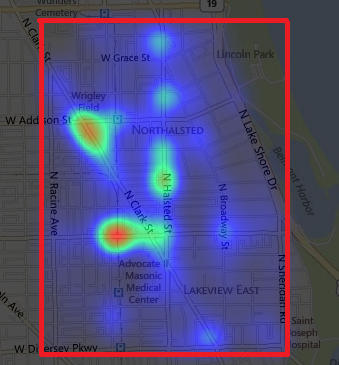 In order to provide context, I’ve devel0ped a heat map of the entire 19th Ward. The red and green highlights are not good; blue and grey are fairly begnign areas (relative to the hot spots). I’ve tried to annotate notable landmarks that have been discussed at local community meetings and forums. So while the norther part of the district is being cleaned up, the crime is merely moving south. 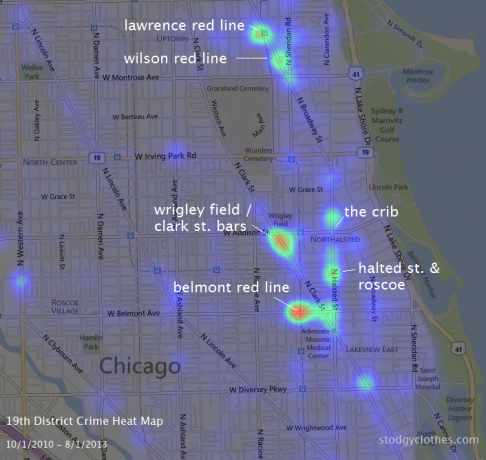 The Halsted and Belmont crime area is spreading throughout the neighborhood. Follow the blog Crime in Wrigleyville & Boystown for ongoing updates. Edit: “Ward” changed to “District” (no effect on data). Added data source URL. When traveling to a new city and looking to explore, I’ll often fire up Waze or Google Maps and search for Chipotle. This usually isn’t because I’m looking for Chipotle, but I’m confident in Chipotle’s real estate choices. This is becoming less relevant as the business expands, but I’m almost never directed to someplace I shouldn’t really be. The lesson here for product manager types is that just because Waze’s customer (me) is asking for something (Chipotle), it doesn’t mean that’s what I want exactly. If I could ask the map to find a relatively cool but sufficiently gentrified place that’d be better. Alas, that’s not a current feature. Naturally, the deal Chicago signed for parking deals is a tricky mess. The hourly rates are now up to $6.50 / hr, more than double the rate of just 5 years ago. The 2008 contract prevents the city from lowering these rates. So the city gets no revenue, citizens are screwed, and there’ s not much we can do about it. However, there’s an angle we haven’t explored. All revenue from parking tickets still goes to the city. While there are provisions that require compensation from the city if roads are closed, meter rates are lowered, or inventory is reduce, there are no provisions that limit the rate of a parking ticket fine. So what can the city do? Chicago should drastically lower the fine for expired meters. This may seem counterintuitive, as it’s the only residual revenue source. But if we drop the price from the current $65 to $5 – 10, anyone parking over an hour wouldn’t have much incentive to feed the meter. If they do get ticketed, the city pockets the revenue. This would greatly increase the volume of tickets, so revenue would likley be hit only marginally. And it creates a perfect incentive for Chicago Parking Meters, LLC to re-open the contract, as the meter revenue would plunge.